I spent much of October on the road, attending a Costume Society of America symposium, spending time with friends, and doing a bit of history-themed touristing. 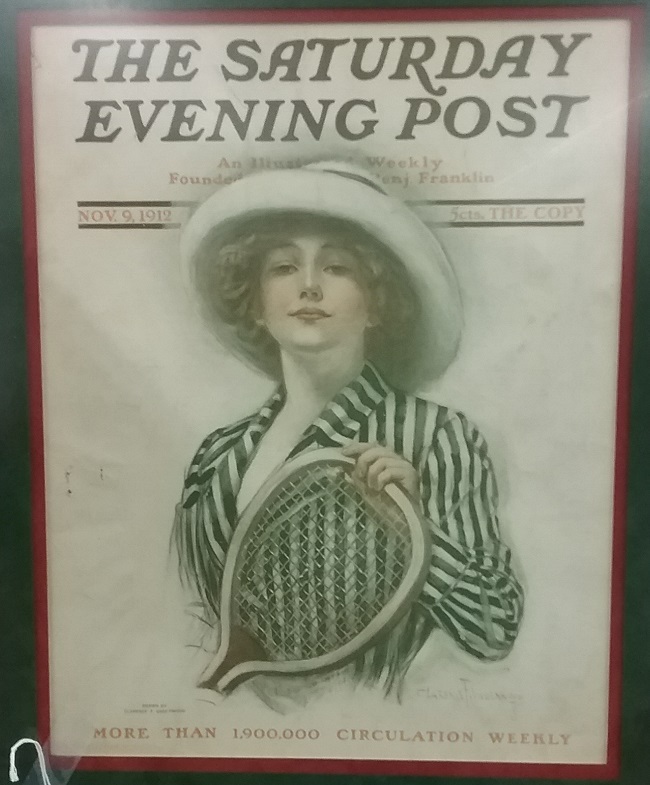 But I was able to fit in a bit of shopping in between visits to historic sites and fashion exhibitions. 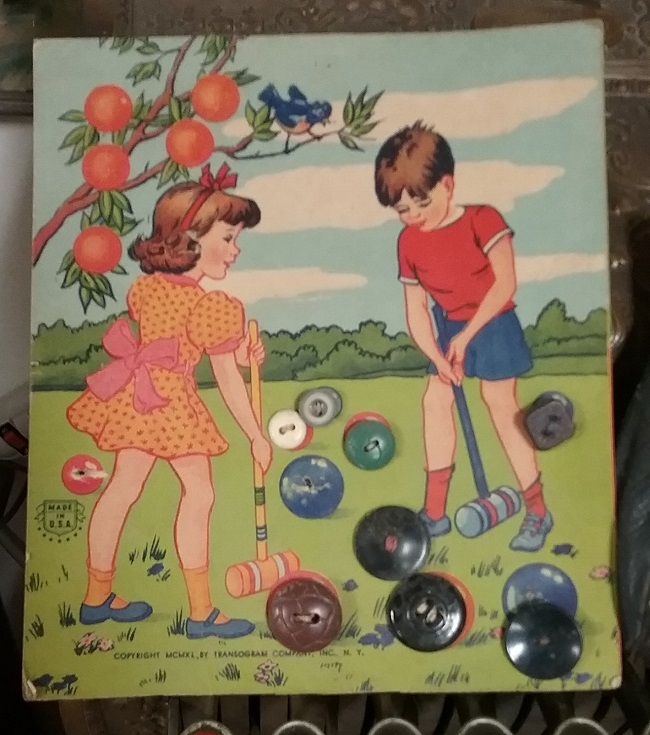 My guess is that the 1940 card above was designed to help children learn to sew on buttons. I love how one of the croquet balls is square. 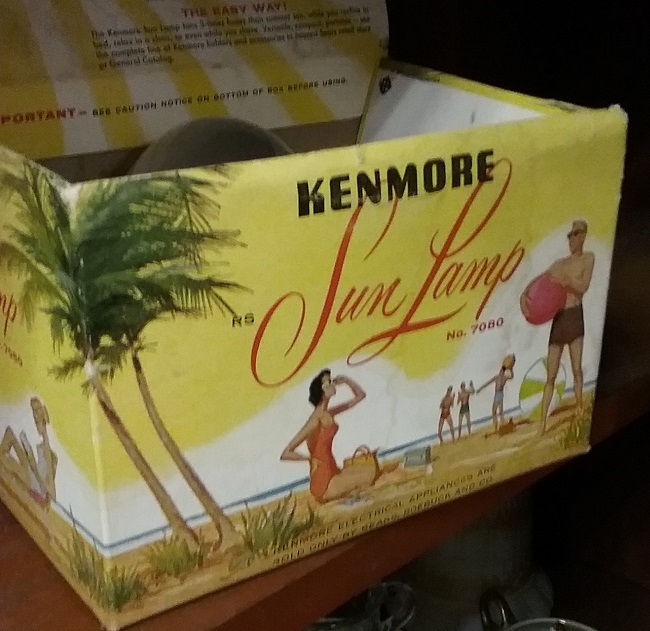 Before there were tanning beds, there were sun lamps. I remember these well, and I can promise you that sitting beneath one is nothing like the box graphic implies. I am a sucker for an old home workshop-made lawn lounger. 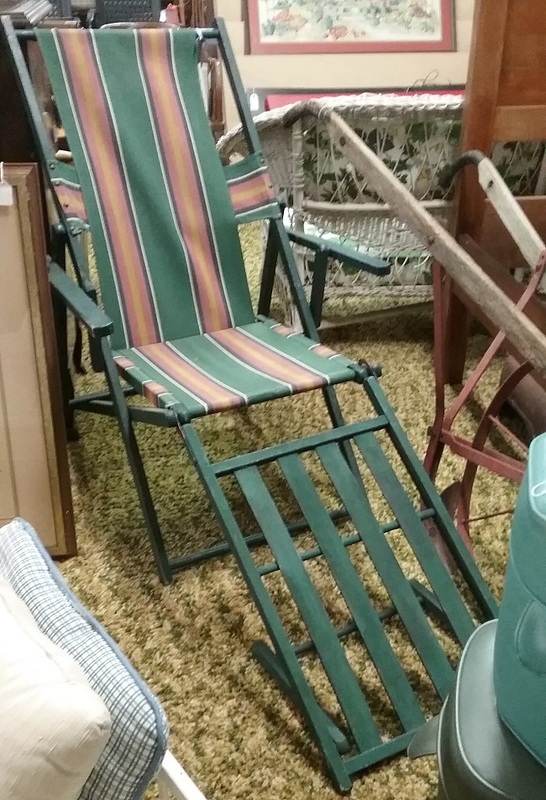 This one is obviously inspired by an ocean liner deck chair. I hope I left enough of the surroundings in the photo so that you can tell how large this book is. Actually it is a catalog of car tires, and was used by some teen as a scrapbook. The stylish cover was the best thing about it. 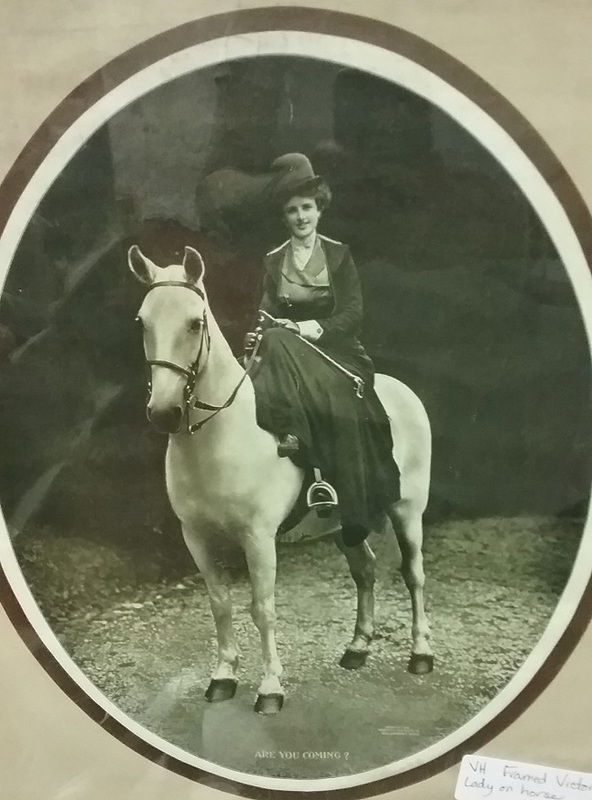 “Are you coming?” asks the lovely woman on her sidesaddle. And is it just me, or does the horse look s if it is levitating? This one was a real heartbreaker, as I thought I’d found another movie star hanger for my small collection. 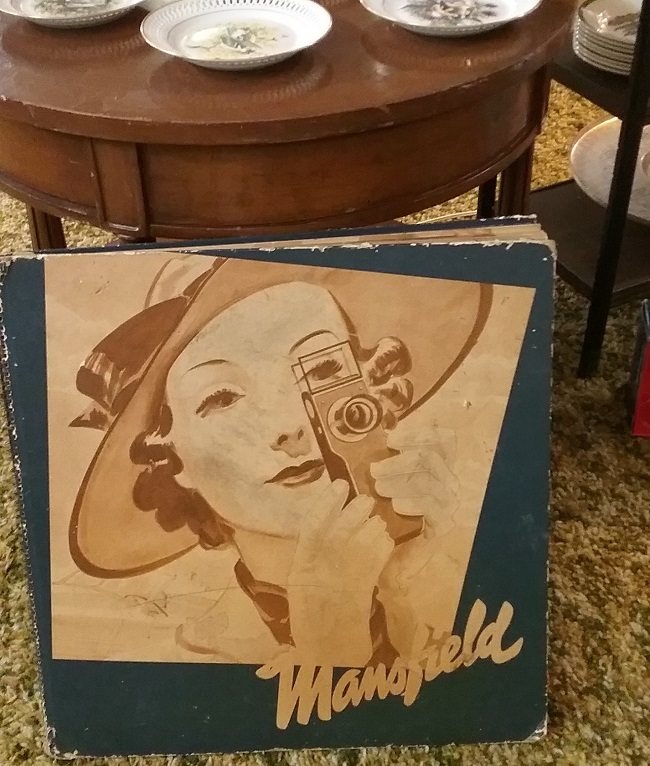 Actually, this was originally a hanger, but it is now only a very damaged prop in a display of hats in an antique mall. 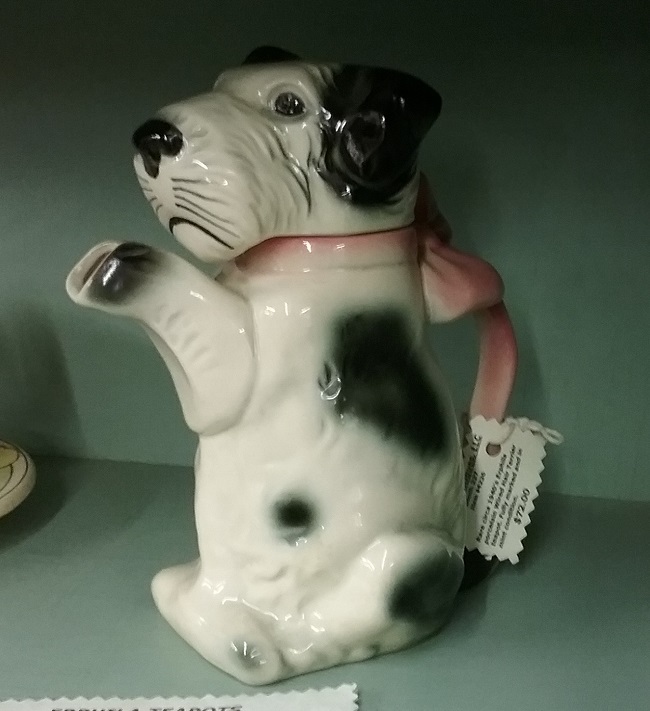 Okay, this is not a Scottie, and I’m not particularly fond of tea, so why was I so tempted by this cute little pot? as was this magazine cover. 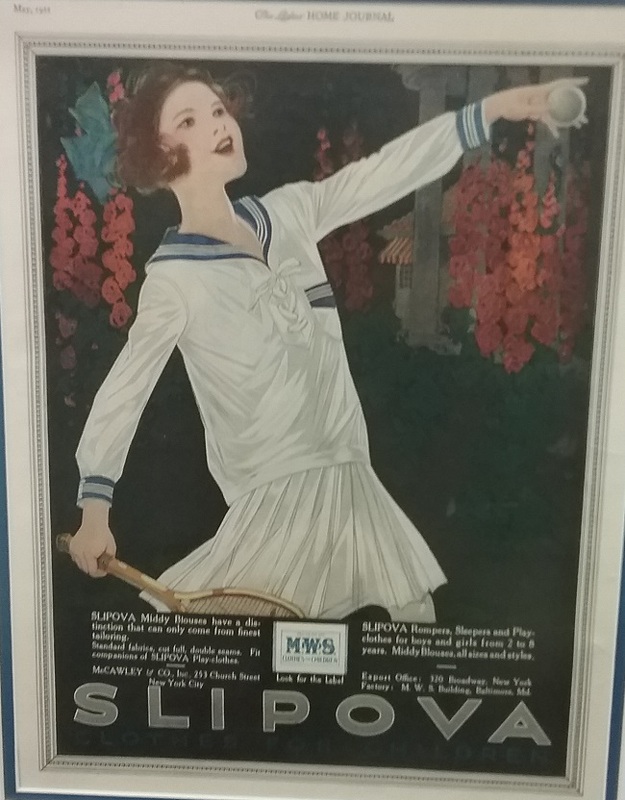 I’ve never understood the market for ads and illustrations pulled out of vintage magazines, mainly because the magazines are so interesting. But seeing these framed, I can see how they would make for cheap but attractive wall decor. 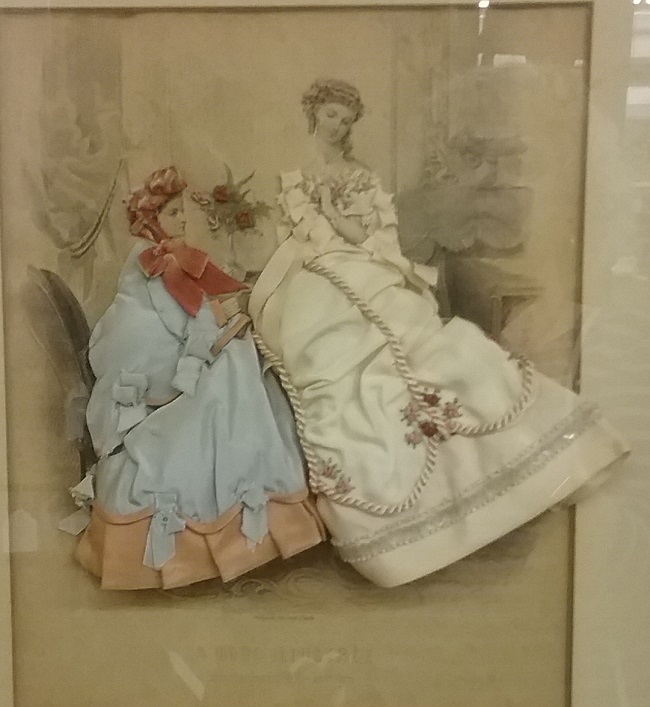 I’ve seen a lot of these old fashion prints with bits of fabric and lace added, but this one is probably the most elaborate ever. I love how the white dress extends off the printed surface. This close-up look shows just how much work went into this. This little girl’s middy was just adorable. 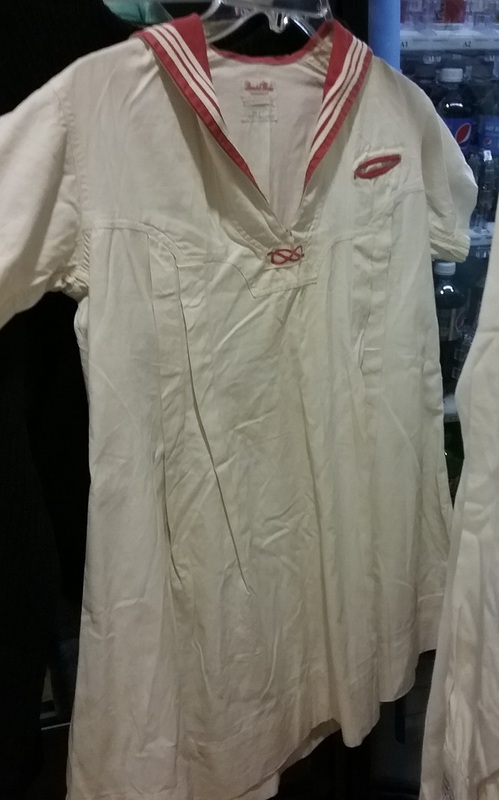 I have to make myself not buy things like this, though I could probably justify this purchase by using this to show the relationship between children’s dress and the athletic wear of older girls and women. Still, I do not need to go out on another tangent. I loved this so much that I tried very hard to justify its purchase. 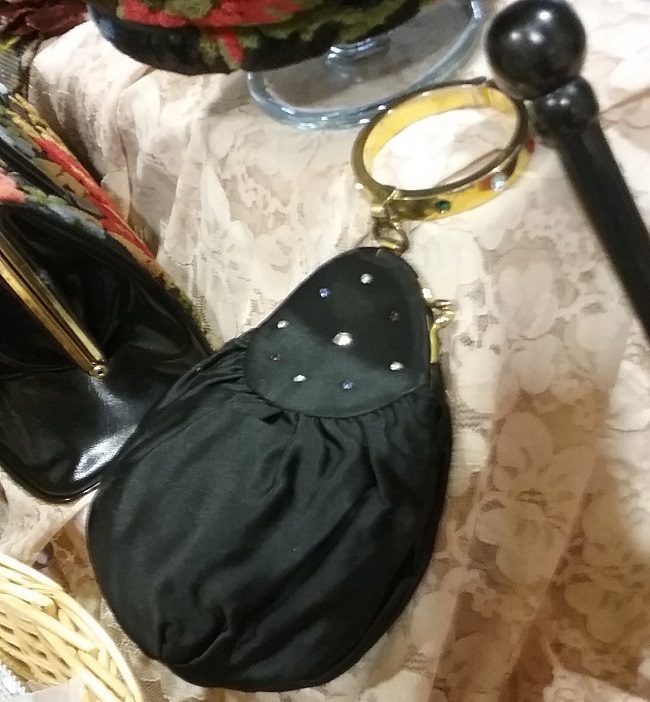 Can you see that it’s a satin evening bag attached to a bracelet? So clever! 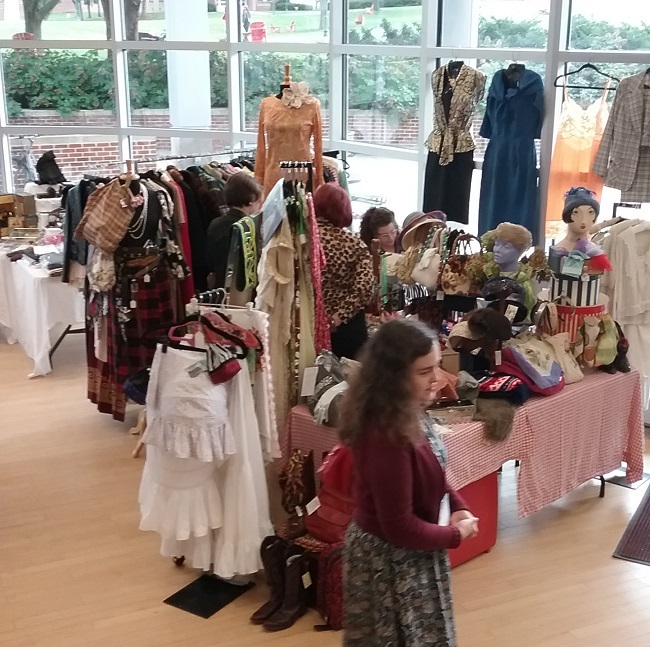 The symposium was really excellent, but the presence of a marketplace with six vintage dealers was the icing on the cake. Dealers, if you ever get the opportunity to set up and sell at a CSA event, take it. I was not the only clothing obsessed collector present. As usual, thank you so much for taking us along on your shopping trips. I just LOVE that button card. I’d never seen one like it, but it can’t be that rare. It would be great for a collector of children’s instructional items. Oh what fun! And, yes that horse does looks like he is levitating! It is my belief that the sidesaddle was invented by a man with who’s ego could not allow him to lose a competition to a woman. It is most difficult to master riding sidesaddle and is unhealthy for the rider and the horse. I have enough trouble staying on a horse astride, much less sidesaddle. You are probably right! Fun trip. 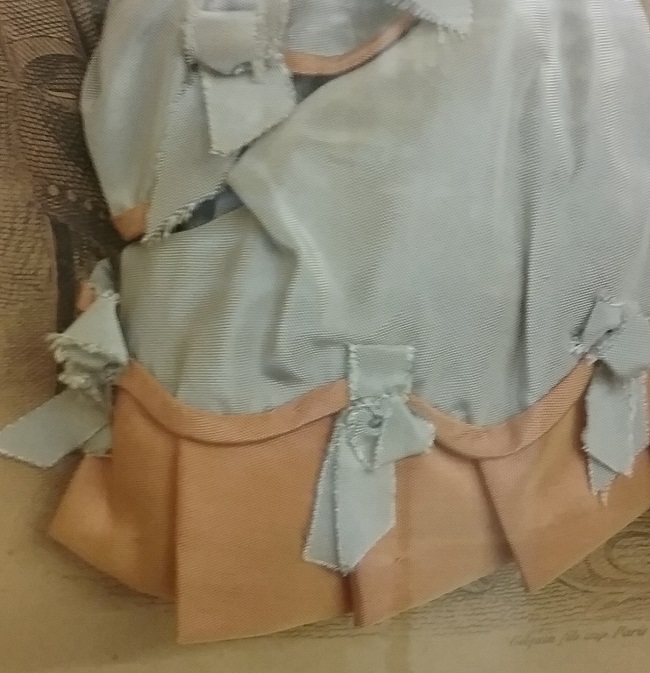 And regarding justifying satin evening bag attached to bracelet et al. –> I’m over here. 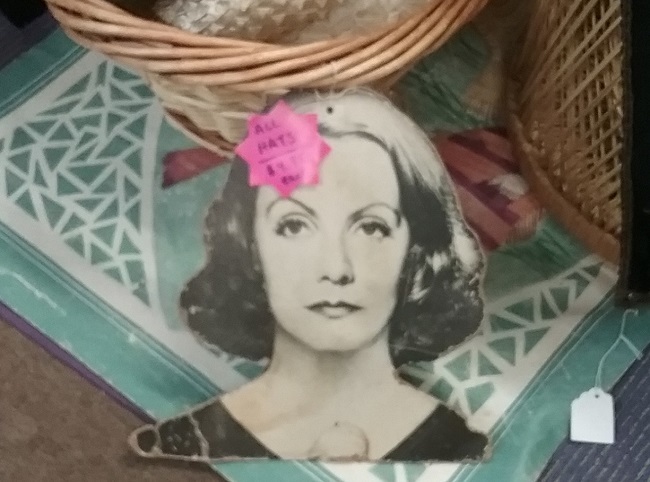 I really, really almost bought it just because it was so interesting. Yes, they levitate and talk! That lounge chair is fantastic! And that purse is dreamy!